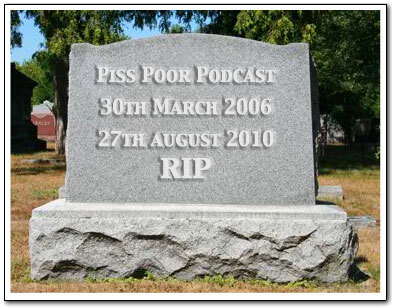 Welcome to the Piss Poor Podcast Garden of Remembrance. All paid up punters as at 27th August 2010 have the opportunity to leave a lasting message and tribute below. Login here to add your message. (All condolonces are subject to checking that 1. You were a paid up subscriber 2. Message is not too offensive 3. Edouard getting around to updating the page. Allow a day or so for your message to appear below).